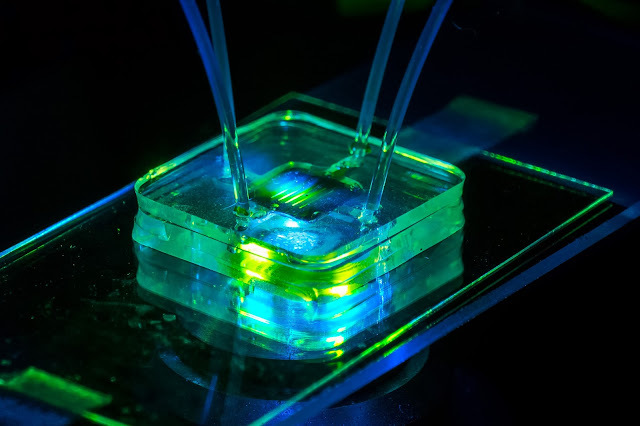 A microfluidic bioreactors consists of two chambers separated by a nanoporous silicon membrane. It allows for flow-based assays using minimal amounts of reagent. The ultra-thin silicon membrane provides an excellent mimic of biological barrier properties. NOTE: This image combines two exposures in order to capture the brighter and darker parts of the scene, which exceed the dynamic range of the camera sensor. The resulting composite is truer to what the eye actually sees. Credit: Adam Fenster/University of Rochester. The ability to shrink laboratory-scale processes to automated chip-sized systems would revolutionize biotechnology and medicine. For example, inexpensive and highly portable devices that process blood samples to detect biological agents such as anthrax are needed by the U.S. military and for homeland security efforts. One of the challenges of "lab-on-a-chip" technology is the need for miniaturized pumps to move solutions through micro-channels. Electroosmotic pumps (EOPs), devices in which fluids appear to magically move through porous media in the presence of an electric field, are ideal because they can be readily miniaturized. EOPs however, require bulky, external power sources, which defeats the concept of portability. But a super-thin silicon membrane developed at the University of Rochester could now make it possible to drastically shrink the power source, paving the way for diagnostic devices the size of a credit card. "Up until now, electroosmotic pumps have had to operate at a very high voltage—about 10 kilovolts," said James McGrath, associate professor of biomedical engineering. "Our device works in the range of one-quarter of a volt, which means it can be integrated into devices and powered with small batteries." McGrath and his team use porous nanocrystalline silicon (pnc-Si) membranes that are microscopically thin—it takes more than one thousand stacked on top of each other to equal the width of a human hair. And that's what allows for a low-voltage system. A porous membrane needs to be placed between two electrodes in order to create what's known as electroosmotic flow, which occurs when an electric field interacts with ions on a charged surface, causing fluids to move through channels. The membranes previously used in EOPs have resulted in a significant voltage drop between the electrodes, forcing engineers to begin with bulky, high-voltage power sources. The thin pnc Si membranes allow the electrodes to be placed much closer to each other, creating a much stronger electric field with a much smaller drop in voltage. As a result, a smaller power source is needed. "Up until now, not everything associated with miniature pumps was miniaturized," said McGrath. "Our device opens the door for a tremendous number of applications." Along with medical applications, it's been suggested that EOPs could be used to cool electronic devices. As electronic devices get smaller, components are packed more tightly, making it easier for the devices to overheat. With miniature power supplies, it may be possible to use EOPs to help cool laptops and other portable electronic devices. McGrath said there's one other benefit to the silicon membranes. "Due to scalable fabrication methods, the nanocrystalline silicon membranes are inexpensive to make and can be easily integrated on silicon or silica-based microfluid chips."